Among the myriad of traditional folk arts, Ca Tru appears as academic art, which has been passed down through generation to generation. It’s true that, in Vietnamese music history, Ca Tru was favored through many dynasties and among the intellectuals in past Vietnam. Its reputation might come from the uniqueness in this type of folk music, the words combination, singing voice, and traditional music instruments, which all made the Ca Tru as we see today. Ca Tru is rooted in folk music, that is why it is a synthesis of art involving a complex blend of poetry, music, and even dance. “Ca” means singing, “trù” means bonus or compliments, Ca Tru singing could entertain the noblest clients. Ca Tru is quite well-known in the Northern provinces, especially the capital of Thang Long (Hanoi today). Virtually, Ca Tru singing now has appeared in 14 provinces along Vietnam consisting of Northern province, central provinces, and Ho Chi Minh city. 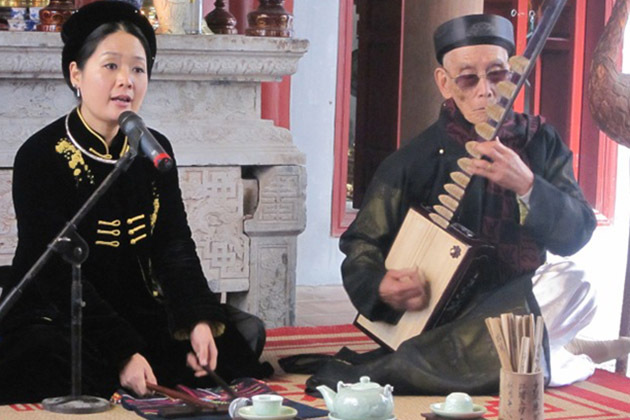 Dating back to 11th century when Ca Tru appeared, but until the 13th century, in the dynasty, Ca Tru was recognized as a form of folk music using to entertain for the royal court. In the 15th century, it was the heyday of Ca Tru and thrived until the early 20th century. Depending on the location, Ca Tru singing is referred to as Ả Đào, hát Cửa Đình, Hát Cửa Quyền, … It’s also in the 15th century, Ca Tru spread throughout northern Vietnam. There have two different stories about the beginnings of Ca Tru singing. The first story states that a woman named Ả Đào created this genre, and she enchanted the enemy with her voice. 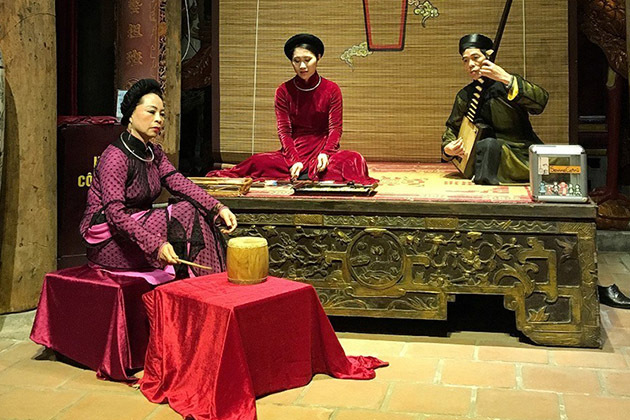 Another one points to a woman named Đào Thị, she was known as a talented musician and a favorite of Ly Dynasty imperial court. 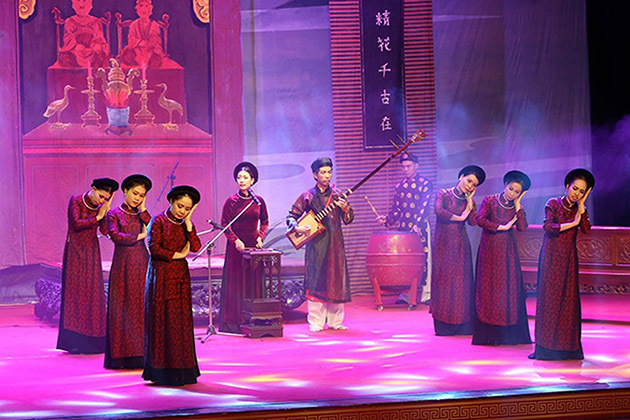 Then women sung Ca Trù, Ả Đào has been called Đào Nương, but the term is no longer used in Modern Vietnam. 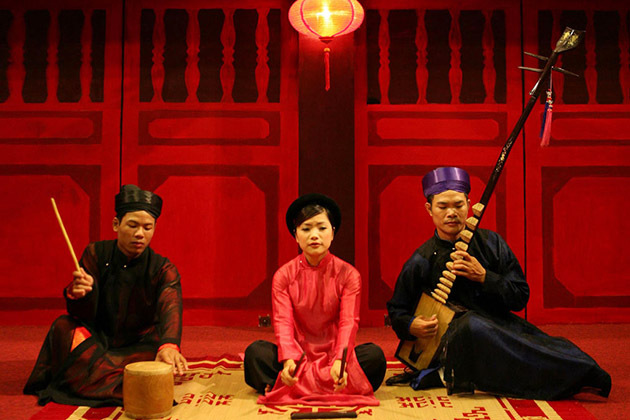 In 2009, Vietnamese ceremonial singing, Ca Tru was officially recognized by UNESCO as a world intangible cultural heritage in urgent need of preservation. It does not like modern music, Ca Tru has its own system of music notation, space, and it is applied by Phach. Đào Nương (name of Ca Tru artisans) needs to learn how to use the Phach properly before learning the vocal method. It takes from 3 to 10 years for a beginner to master the vocal as well as the Phach techniques. Another uniqueness of Ca Tru is that its lyrics are poems, and especially, Ca Tru can fit any types of poem no matter long or short. Many years ago, officials or poets would invite Dao Nuong to their home and perform Ca Tru using their poems as the lyrics. And the host together with their friends would enjoy and comment on the melody. 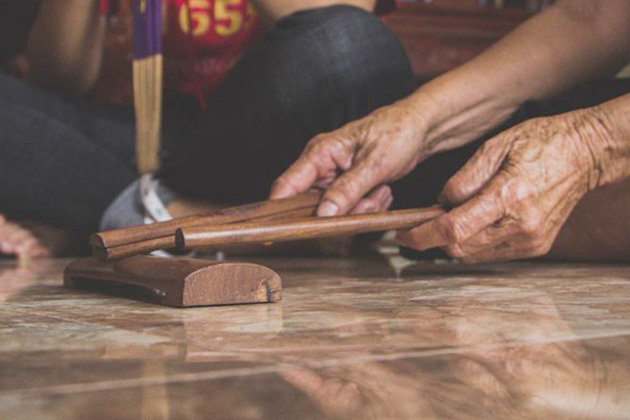 Take a look to a snapshot of the history of Ca Tru singing’s development and Ca Tru Instrument as well, a genre of ancient ceremonial singing recognized by UNESCO as the world intangible cultural heritage. Now, let’s talk more about the instruments of Ca Tru and vocal style. The most common form of Ca Tru has three performers: the female vocalist, a lute player, and a spectator, sometimes we have dancers. 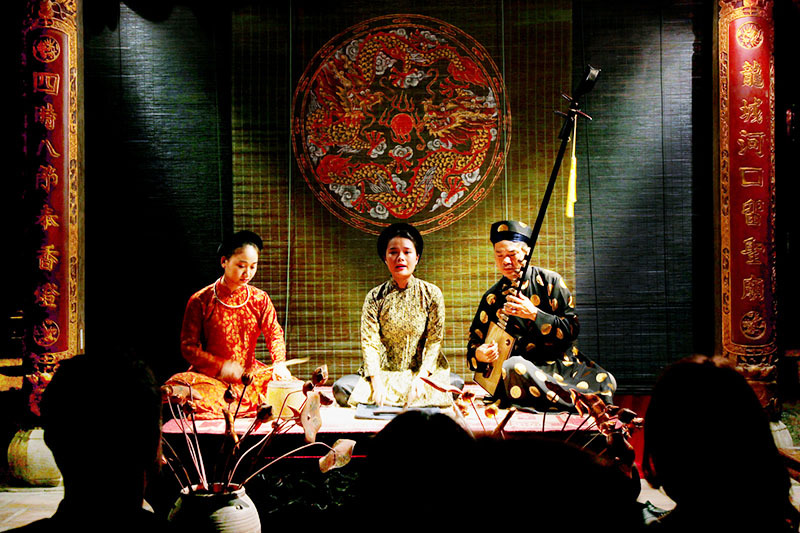 The female singer is the vocals whilst, she plays Phach (Phach includes two wooden sticks beaten together on a small bamboo bar), and Phach plays a role as the second voice, Phach plays as a percussion. It takes at least 6 months to learn Phach. There was a man who plays Đàn Đáy (or 3 string plucked lute made from sycamore wood) together with Dao Nuong. The last participant is the spectator who is a scholar or connoisseur of the art and who play praise drum (usually with every passage of the song). The praise drum or trống chầu is made from buffalo skin and jackfruit wood mounted on a stick, which creates the typical sound. As mention above, it takes 3 to 10 years for a beginner to master at both the vocal and the Phach techniques. The female singer has to use breathing techniques and vibrato to create unique ornamented sounds while playing the clappers or striking a wooden box. The most difficult part of Ca Tru is the singing and how to use the Phach. 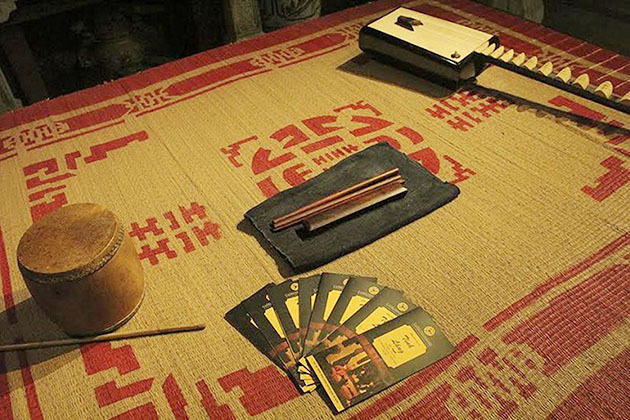 To accompany the singing, many people can mimic some tunes of Ca Tru, but it is impossible to fake knowledge of using Phach, which is the backbone of the singer. Thus to have a flawless performance, you need to master playing Phach.